Fernando Angulo is Head of International Partnerships and Global Speaker at SEMrush, with more than ten years of experience in Digital Marketing. He is the official Influencer Marketing trainer at the prestigious BrightonSEO, he trained marketing teams of companies such as Expedia, T-mobile, Prestashop and Bing among others, and he also established the first Influencer Marketing team at SEMrush, which has around 200 influencers from more than 20 countries. 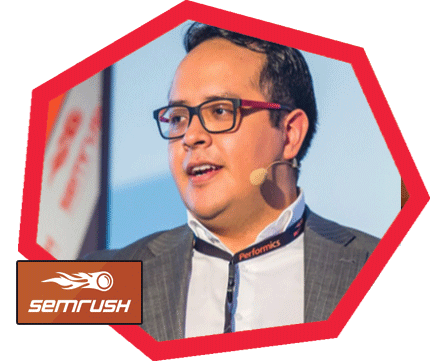 As an active member of SEMrush’s marketing team, Fernando specializes in B2B search marketing, e-commerce, competitive intelligence and influential marketing. During his sessions and workshops, he immediately involves the audience with his energy, sense of humor and a large number of practical examples and real cases. In addition Fernando he likes to be the father of 2 beautiful girls, be a husband and travel around the world. The Marketing Business Summit promotes strategies, methods, trends and techniques about Digital Marketing and Business: not only SEO, Social media, ADV, Growth Hacking, but also Legal, Motivation and Coaching. We’ve selected the best speakers who are experts in different areas, such as Web Marketing and Coaching. During the event there will be a simultaneous translation. #MBSummit: an unique an different event!